ASTANA (Interfax-Kazakhstan) – During his visit to France Kazakh President Nursultan Nazarbayev met Jean-Pierre Talamoni, Director of International Development at EADS, Nazarbayev’s press office announced in a statement on Thursday. Astrium, a wholly owned subsidiary of EADS, is dedicated to providing civil and defence space systems and services. In 2009, Astrium had a turnover of €4.8 bln and more than 15,000 employees in France, Germany, the United Kingdom, Spain and the Netherlands. Its three main areas of activity are Astrium Space Transportation for launchers and orbital infrastructure, Astrium Satellites for spacecraft and ground segment, and Astrium Services for comprehensive end-to-end value-added solutions covering secure and commercial satcoms and networks, high security satellite communications equipment, bespoke geo-information and navigation services worldwide. “The sides discussed questions of developing cooperation between Kazakhstan and EADS in the area of aerospace industry,” the statement said. According to the press office, the sides discussed the Astrium project, which proposes the construction of a facility for the assembly and testing of spacecraft in Kazakhstan jointly with EADS. “Nursultan Nazarbayev and Jean-Pierre Talamoni noted the need for developing a strategic partnership between Kazakhstan and Europe in the area of aerospace industry,” the statement said. The partnership between Astrium and JSC NC Kazakhstan Gharysh Sapary (KGS), the national company charged with the development of Kazakhstan’s space programme reached a major milestone in 2010 with the signature of a contract for a Satellite Assembly, Integration and Test (AIT) Centre in Astana. Under the contract Astrium will provide and install the various test equipment (mechanical, radiometric, thermal and acoustic facilities) at the new AIT Centre. Astrium will also assist KGS in the construction of the AIT Centre to ensure coordination with the test equipment. 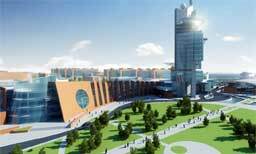 The AIT Centre will form part of the Space City that the Kazakhstan space agency, Kazcosmos, is developing in Astana. The city will also include the ground segment for the two Astrium-built satellites, as well an administrative building and a museum dedicated to the country’s long space history. Kazakhstan has been involved in spaceflight since the very beginning. In 1957, the Soviet Union chose Baikonur as the launch site for the first satellite, the legendary Sputnik 1. Then, in 1961, the world’s first astronaut, Yuri Gagarin, took off from Baikonur. Baikonur is still Russia’s primary launch site under lease from the Republic of Kazakhstan. Since the early space age, all the human Soyouz flights to the Space Stations have taken off from Baikonur. Kazakhstan is now developing new ambitions in space as part of the programme A New Kazakhstan in a New World.